Exercise has many health benefits for all age groups, and there are a great number of walking benefits for seniors. Exercise is necessary to maintain our independence and quality of life. 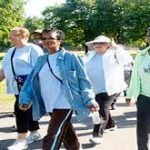 The type and degree of exercise depends on many factors for each individual, and this discussion is for those able to walk for exercise. There will be future posts for those of us unable to walk, whether it be a temporary or ongoing situation. The American Heart Association calls walking the “single most effective form of exercise”. It is something the majority of us can do conveniently. It is easier on the joints than many forms of exercise. If you are a runner already, that remains a good form of exercise for you, but starting to run in your senior years can be very hard on your joints that aren’t accustomed to it. Walking is a natural movement. It encourages good posture and spine alignment, especially if you stay aware of standing tall while walking. It helps strengthen the muscles which help stabilize the joints in your lower extremities, helping to prevent injuries. Walking regularly will help burn some calories, decrease the risk of high cholesterol, high blood pressure and diabetes. And these are just a few of the benefits of walking for seniors! I think one of the things many of us fear as we get older is our mind getting less sharp. My Mom had Alzheimer’s, so it is definitely something I find worrisome. I think all of us notice some memory changes as we get older–but what is normal, and how do we keep our memory as healthy as we can? A study from Columbia University has found that walking regularly as exercise actually helps with the development of new nerve cells in the hippocampus or memory hub! This area of the brain is unusual in that it is capable of the birth and development of new nerve cells, something that doesn’t happen in most areas of the brain. And this is the area of the brain associated with memory! The Harvard Health Letter quotes Dr. Gad Marshall as saying “The most convincing evidence is that physical exercise helps prevent the development of Alzheimer’s or slow the progression in people who have symptoms. The recommendation is 30 minutes of moderately vigorous aerobic exercise, three to four days per week.” Walking fills the bill! Exercise in general increases endorphins, helping to improve our mood. Walking also gets us out in the fresh air and sunshine, helping to lower anxiety and depression. Stress, anxiety and depression all are associated with short-term memory loss, and walking as exercise has been shown to help lower all three! Mobility and independence go hand in hand. Certainly there are many individuals with major mobility issues who are independent, but it is in spite of their disabilities and because of their determination. For most people, as mobility decreases, so does their ability to live independently. Walking helps keep us mobile, or even improves our mobility. It helps strengthen our muscles, thus stabilizing our joints, increases our circulation, improves balance, can help decrease arthritis pain, and may alleviate back pain. 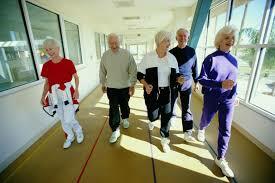 All these are important in themselves, and also decrease the risks of falls and injuries. Most lower back pain benefits from walking routines. Check with your doctor to see if walking is recommended for you. Starting walking exercise may increase the lower back pain at first, but if you keep going it will usually decrease or even eliminate the pain. Many studies have shown that the gentle stress put on bones by walking prevents loss of bone density, and actually helps increase density. Low bone density (or osteoporosis) increases the risk of fracturing a bone, even with minor trauma. Walking isn’t stressful to the joints as many other forms or exercise are. It puts enough mild stress on your bones to encourage good bone strength, without the risk of injuries which may be present with more concussive forms of exercise. Walking gets your heart rate up, which in turn improves your overall circulation. This has many benefits for your whole cardiovascular system. Do you have leg pain with exercise, cramping in your legs, are your feet and legs cold more than they used to be? These are symptoms of poor circulation in your legs, sometimes from peripheral artery disease (or PAD). This is a narrowing of the arteries that reduces circulation, particularly in the legs, causing pain and cramping from lack of oxygen. If you suspect this may be you, please check with your doctor or health professional. 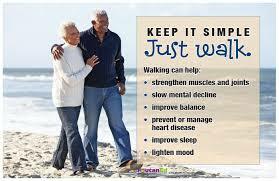 Walking gets your blood flowing more strongly, and can be a major factor in preventing or improving PAD. While you are improving circulation in your legs, you are simultaneously improving circulation to the rest of your body, particularly your heart, brain and lungs. This can be a major factor in reducing your risk of heart disease, stroke and breathing problems. Stroke and heart disease are major risks to the senior population. 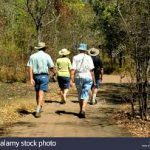 A regular walking program significantly reduces the risk of both, especially when coupled with other healthy lifestyle choices. There are multiple studies which confirm this statement. Some focus on the speed you walk, some focus on the length of time spent walking, but all agree that any regular walking helps lower your risk of stroke and heart disease. 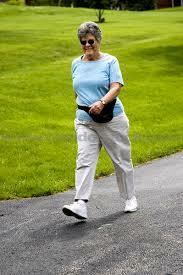 When starting on a walking program, if you aren’t already walking regularly, be realistic. Try to set goals you can actually reach. Shoot for unrealistic goals, and you are much less likely to follow through. The Center for Disease Control and Prevention recommends older adults participate in mild to moderate aerobic exercise at least 2.5 hours a week (which is only about 20 minutes a day). If you are just starting walking, aim for only 5 to10 minutes a day, and build up. If you are uncomfortable during or after your walk–sore, achy, tired–maybe cut back for a couple days and then build back up. If you already are walking 20 minutes a day, try stretching your walks longer for even more benefit. Find some friends who may like to walk with you. Chatting with friends makes walking more fun, and arranging to walk with someone else will get you out walking when you may choose not to if you hadn’t made a walking date. Find places that are interesting. Even if you have to drive a bit, taking a short (or long, if you are up to it) hike is more interesting than walking around the block a few times. Some terrain changes, slopes, hills, etc. will also increase the benefit of the walk. You might find that as you build up your walking endurance you might like the challenge of hiking! 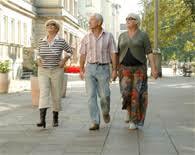 Many communities have walking groups, or you might start one, if making it a social activity will increase your enjoyment and dedication. Have a dog? Most dogs love walks, and it is as good for them as it is for us. Take the dog on more or longer walks and you will both benefit. Want to go hiking and take your dog? Here is a link to an article about On Or Off Leash Hiking With Your Dog. If you have any serious health issues, or have had no recent exercise, start your program with a talk with your doctor or health professional. They may have guidelines for you to proceed safely. Choose how often you are going to walk. Five times a week is a good goal, or at first you may choose every other day or a similar schedule. Start easy–5 to10 minutes a day is reasonable if you haven’t been getting any exercise, and build up to longer as it becomes easier. Each walk, start at a comfortable warm-up speed, then try picking up the pace for the middle of the walk, then ease back to a slower cool-down pace at the end. You may not want to go beyond the warm-up pace for the first few walks. Notice your comfort level and adjust accordingly. Ideally, you will walk briskly enough that you are breathing harder, but are able to carry on a conversation. How long and how briskly you walk is different for different individuals. Remember to set realistic goals so you will be able to reach them. Your ultimate goal may be walking 20 minutes a day 5 times a week, or hiking several hours a couple times a week. Work toward what suits you and is realistically possible for you–your goals are YOURS. 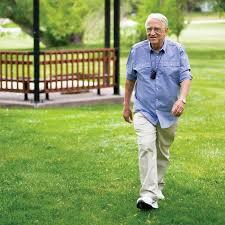 Exercise in general, and walking in particular has many benefits for seniors. It improves mood and memory, lowers risk of high cholesterol and blood pressure, decreases risk of diabetes, improves overall circulation which aids in preventing or improving PAD, decreases risk of heart disease and stroke, contributes to improved strength and endurance, increases bone density, the list goes on and on! It’s convenient and safe. Let’s all get out and walk! 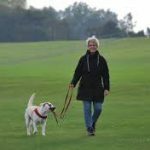 Let me know how your walking program is going, or share tips on walking. I personally am “hiking” an hour a day, trying to increase duration and difficulty of terrain. I’m trying to tackle some fairly steep hills once or twice a week, but only for one or two hills in each of those walks. Leave a comment on your walking progress, or email me directly at jane@seniorssuccesscoach.com with questions or comments. Happy walking! WEALTHY AFFILIATE REVIEW 2019–WORKS FOR ME! When you mention you Mom has Alzheimer’s, my mother in law is in a nursing home with that too. Like you mention it’s worried my wife & I to bits also. We regularly go for long walks on a weekend and summer’s evenings plus we have taken up swimming twice a week in order to maintain a more active lifestyle as we enter into our 50’s. 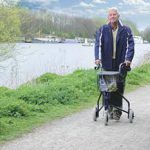 Thanks for your article regarding the walking benefits for seniors, this is something we should all contemplate to remain healthy in my view. I totally agree! And you have chosen two wonderful forms of exercise which should provide great health benefits. I love that studies show that exercise actually can help you improve your memory and prevent or slow Alzheimer’s. It’s nice to feel we can do something positive! Interesting read. I don’t consider myself old, I just turned 50, for the last few years I go jogging 2 to 3 times a week. What I have found recently is that my knees start to ache after each run. I think my body is trying to tell me something. So I was thinking about swimming instead, I never thought about walking because I assumed it wouldn’t really do much for me. Having read your post I think I might be wrong about walking. Walking is awesome exercise. So is swimming, but unless you have your own pool, it’s less convenient. Running/jogging can definitely be hard on the knees! Walking, and/or swimming would be kinder to them. My mother used to say getting older wasn’t for the faint of heart. I’ve found she knew what she was talking about. It is disheartening to have to modify or give up what we have been enjoying, but sometimes our bodies urge us to. When my rough terrain hiking got too much for my body, I gave it up completely for awhile. Then I realized how much I missed it, both mentally and physically. So I modified it to gentler hikes and feel 100% better than when I wasn’t hiking at all. Good luck with whatever exercise you settle on–enjoy it and good health!